Containment Protocols: RPC-196-A is to be contained via the ritualistic sacrifice of three (3) axolotls1 per yearly period, towards RPC-196-A. (Henceforth referred to as Procedure 196-Delta) For a currently unidentified reason, this appeases RPC-196-A. The 'sacrifice' is to be conducted by a 30 year old female (specifically), wherein they are be administered a randomly generated quantity (within reason) of amphetamine, and then sit cross-legged with the axolotls across from them. After three minutes of this behavior, the axolotls will disappear via dimensional disturbance, and RPC-196-A will be theoretically contained for another year. Due to the nature of RPC-196, and its harmful effects on normal time progression, it is to be held at Site-099. Description: RPC-196 is (in theory) the fourth dimensional equivalent of American cosmologist Carl Sagan, manifesting downwards into our dimension. Though RPC-196 retains all memories of Mr. Sagan, it has shown extensive knowledge of extradimensional "affairs", and is under the control of a currently unknown reality bender. RPC-196 has been extremely cooperative in testing, explaining its condition with Authority personnel. At one point in its natural lifespawn, RPC-196 made a deal with an unknown reality bending entity (RPC-196 -A) in what it thought was traditional tax returns. In reality it seems to have given the entity control over its fourth dimensional equivalent, prolonging the 4D version after the 3D version's death, instead of along linear time such as a normal human lifespan. Due to the naturally unstable nature of this deal, RPC-196 is sometimes seen shifting in and out of reality. This is perfectly normal, and is not to be treated as a containment breach. RPC-196-A is currently attempting to descend to our dimension to 'retrieve' RPC-196 , but is kept at bay via Procedure 196-Delta. It is unknown how this works or what causes this bond between RPC-196 and RPC-196-A, only that RPC-196 has claimed it to work. And by all evidence, it seemingly has. RPC-196 is able to produce three dimensional shadows of four dimensional objects, due to its nature. If RPC-196 is seen seemingly studying one of these objects, it is to be regarded as RPC-196 doing research into dimensional physics. RPC-196 has shown interest numerous times in working for the Authority, however given its relationship with RPC-196-A, Theta classification is to remain pending until foreseeable termination of RPC-196-A. Due to the nature of RPC-196 and RPC-196-A, it is to be noted that RPC-196 has expressed extensive knowledge of other interdimensional entities such as RPC-009. Investigation is ongoing into how RPC-196 shall react when encountering other entities of this stature, however cross-testing is currently denied. Discovery Log: RPC-196 was discovered approximately fifteen days after the death of Carl Sagan, when MST Whiskey-07 discovered a temporal anomaly on the moon. This temporal anomaly was revealed to be RPC-196, and has since been contained at Site-099. Foreword: RPC-196 was asked to give any and all information it had on its current state. Dr. Khan: You can begin now. RPC-196: Well, you see, I made a deal. With something, for lack of a better term, fourth dimensional in nature. Dr. Khan: Go on, please. RPC-196: It told me I could continue my research. Of course, I was thrilled to have met an extra-terrestrial, let alone one from a higher dimension, so I agreed. RPC-196: This was a mistake on my part. RPC-196: Well, if it wasn't already clear, I'm merely a fourth dimensional.. hologram, if you will, of my normal self. Dr. Khan: Your normal self being? RPC-196: Why, that should be obvious. 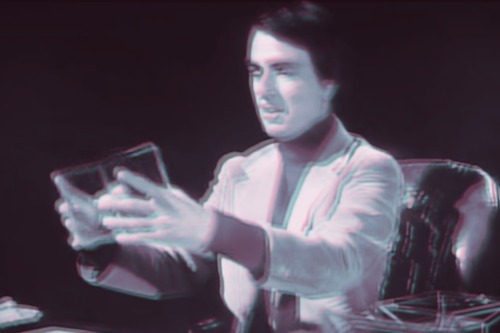 I'm Carl Sagan, sir. Dr. Khan: You could be an entity posing as Mr. Sagan, there's no way to tell. RPC-196: Well I suppose you're right. RPC-196: However, the agreement with the entity was that I was to venture into the fourth dimension and report my findings back, but not to leave. As you can tell, I wasn't exactly obedient with that end of the deal. Dr. Khan: So is this entity going to attempt to retrieve you? RPC-196: Yes I believe so. RPC-196: It can be kept at bay through a certain, for lack of a better term, ritual, that I found during my research. Dr. Khan: Would you care to elaborate? RPC-196: It sounds ludicrous, I agree, but the science behind it is tested. If you wish to make an apple pie, you must first create the universe. Dr. Khan: I'll.. Make note of that. Thank you, RP- Mr. Sagan. Closing Statement: RPC-196 has displayed numerous accounts of wishing to work with the Authority to continue its research. It has also displayed interest in seeing public opinion of itself prior to its death. Both of these proposals are currently being reviewed. Addendum: As of incident RPC-196-2, the containment procedures for RPC-196-A are proven true to work. When they are not followed, RPC-196-A will manifest as a black axolotl and attempt to latch onto RPC-196, for unknown reasons. It will then [DATA EXPUNGED], resulting in ████ deaths, and the disappearance of RPC-196. RPC-196 was later brought back via continuing procedure 196-Delta. Addendum 196-1: Due to its numerous requests and notable cosmologist status, Theta reclassification for RPC-196 is pending.